After Bharat Ratna Lata Mangeshkar, star of millennium Amitabh Bachchan became the second recipient to receive the prestigious 2nd Yash Chopra memorial award. Dedicated to the memory of the late producer-director, the Yash Chopra Memorial Award has been instituted by the TSR Foundation of T. Subbarami Reddy. The jury members consisted of Anu Ranjan, Hema Malini, Simi Garewal, Pamela Chopra and Anil Kapoor. SimiGarewal, the eminent Bollywood actress and member of jury candidly confessed, “As a jury, when we were thinking about Amitabh Bachchan for this award, we didn't even have to catch a breath. Everyone was unanimous of the fact that he is deserved it." Amitabh Bachchan will be conferred the award in December this year, the date hasn't been decided yet. The award consists of a gold medal and prize money Rs. 10 lakhs. The award is quite apt for Big B because Amitabh Bachchan besides having dedicated his entire life to Indian film industry shared a warm relation with Yash Chopra. It was with Yash Chopra, who gave Bachchan some of his most memorable hits like DEEWAAR (1975), KABHI KABHIE (1976), TRISHUL (1978), KAALA PATTHAR (1979), SILSILA (1981). In fact it was Yash Chopra who dared to change Amitabh Bachchan’s angry man image into a romantic poet in KABHI KABHIE and SILSILA. 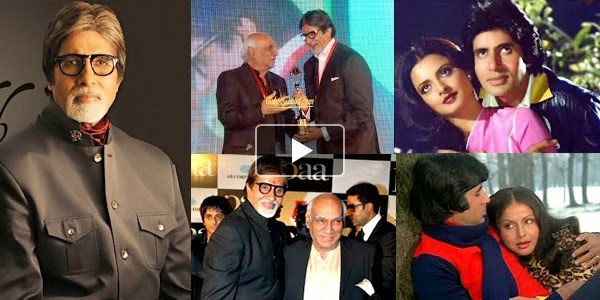 Further when Amitabh Bachchan was in financial crises after the failure of his home production ABCL (Amitabh Bachchan Corporation Ltd) it was once again Yash Chopra, who gave a new lease of life to Amitabh Bachchan with his hit film MOHABBATEIN (2000) and opened doors of stardom yet again! Raju Hirani – The director with Golden Touch! Aamir Khan meets his idol!